Leave hunches and hearsay behind and instead focus on the performance data your online presence is generating. Understand the health of your digital, social and search landscape and benchmark yourself against your closest competitors. Prioritise your time to focus on the activities that will give you the greatest impact. Ensure every digital step you take (whether blogging, SEO or social media) is a step in the right direction and measure the subsequent impact on business growth. 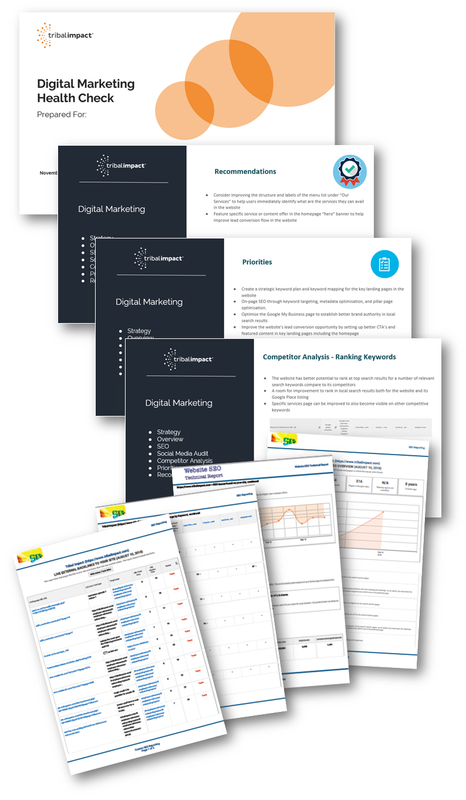 Use the analysis, data and reports to support your business case for further investment in Digital Marketing. Understand the steps you'll need to take to improve the current situation and align costs to those investments with confidence. Let us take the pulse of your digital marketing efforts with our Digital Marketing Health Check service - a comprehensive analysis of the practices, strategies and outcomes you have undertaken to establish your brand online. Once the analysis is complete, our report offers insights into the status of your online visibility and includes actionable steps to help improve your online presence. Our Digital Marketing Health Check, and the subsequent plan of action, will give you a complete picture of your current online presence and an inbound strategy road map to help you do the things you need to do to dominate your market. We will deliver a detailed report to shows you the highest priorities and technical issues for optimizing the digital presence of the business. The deliverable is divided into two parts - Health Check report with data tool documents and 1 hour presentation call. NOTE: This service will take between 5 to 7 business days to produce from the time of receipt of all required data. Not included in this Health Check: IT, email settings, hosting, CMS or Domain DNS errors or settings, potential issues such as outdated WordPress version and incompatibility of Plugins etc. Customer to provide log-in access to Google Analytics, social media channels and website for complete analysis. 2 seconds is all companies get when it comes to website load time. Anything longer increases bounce rates by 50%. Vice President Marketing & Strategy @ Bramasol, Inc.
My team and I found the process excellent. From the beginning to end it was professional and well organized. The interviews with my team were well done and well organized and the results were actionable and insightful. We will be using this to help direct and drive some of our improvement activities for 2019. I look forward to continuing our relationship with you and your team in 2019.